The Mongolic Languages represents the first comprehensive treatment of the Mongolic language family in English. The Mongolic languages form a linguistically well defined but geographically widely dispersed family of more than a dozen separate languages, distributed from East and North Asia (Mongolia, Manchuria and Southern Siberia) to Central and West Asia (Northern Tibet, Gansu, Sinkiang, Northern Afghanistan and the Caspian Region). Written by a team of international specialists, this in-depth volume is divided into twenty chapters. The first three chapters focus on reconstructed and historical forms of Mongolic. 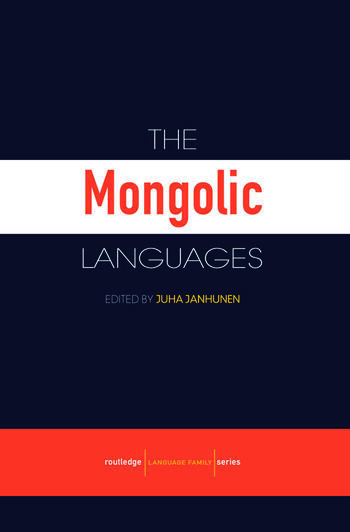 These are followed by fourteen chapters each containing synchronic and diachronic descriptions of a modern Mongolic language or dialect group, including Khalkha, Buryat, Dagur, Ordos, Kalmuck and Moghol. The final three chapters deal with areal and taxonomic issues. This unique resource is the ideal companion for advanced undergraduate and postgraduate students of linguistics. It will also be of interest to researchers or anyone with an interest in Mongolian Studies or Central Eurasian history and cultural studies. Juha Janhunen is Professor and Chair of East Asian Languages and Cultures at the University of Helsinki. His publications include Manchuria: An Ethnic History (1996), Material on Manchurian Khamnigan Evenki (1991) and Material on Manchurian Khamnigan Mongol (1990). His research interests include, in particular, the Samoyedic, Tungusic and Mongolic languages, though he has also worked on Japanese, Korean, Tibertan and Palaeo-Siberian.